Every summer you know I’m all about those Zucchini Boats. 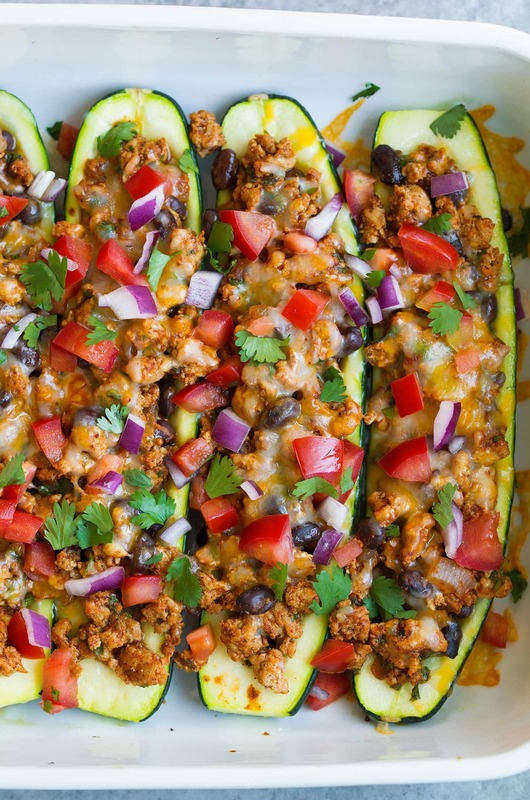 These Taco Zucchini Boats are the perfect use for the abundance of summer zucchini. They’re jam packed with flavor, they’re perfectly filling, and have less carbs than the traditional flour or corn tortilla tacos. Talk about great way to get your veggie quota in for the day! 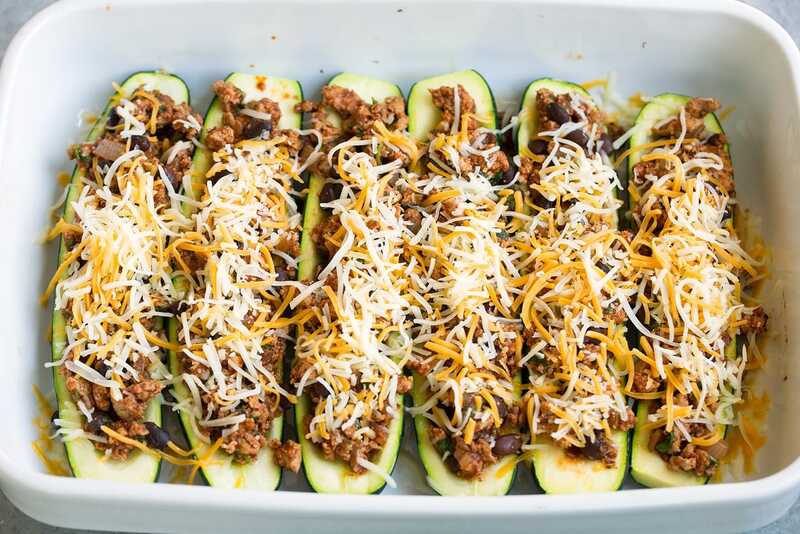 I’ve already shared Lasagna Zucchini Boats, Chicken Enchilada Zucchini Boats, Zucchini Pizza Boats and even Philly Cheesesteak Zucchini Boats (oh and then last week I made a Chicken Parm Zucchini Boat but they were gross so obviously they didn’t make the cut here). 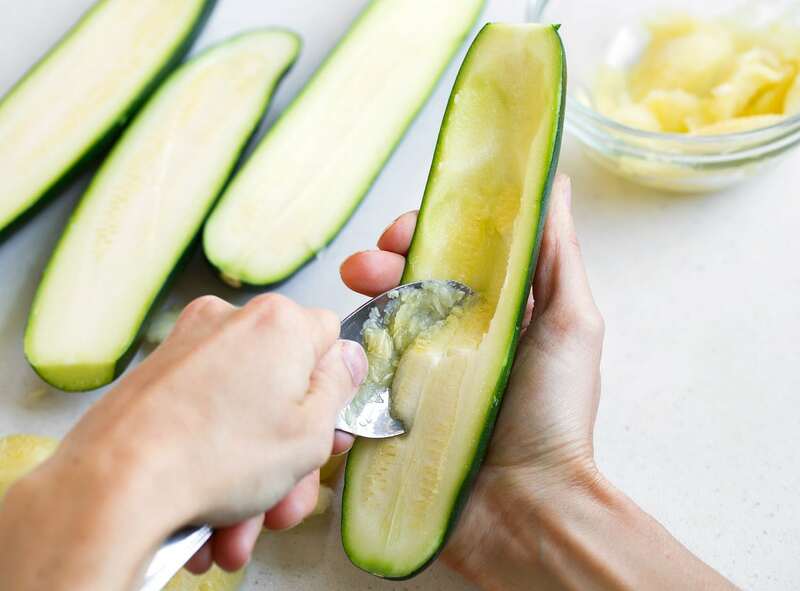 So you can see during summer it’s time to make zucchini boats. And now this newest addition of zucchini taco boats might just be my favorite because tacos are life! In other words you need to try these. 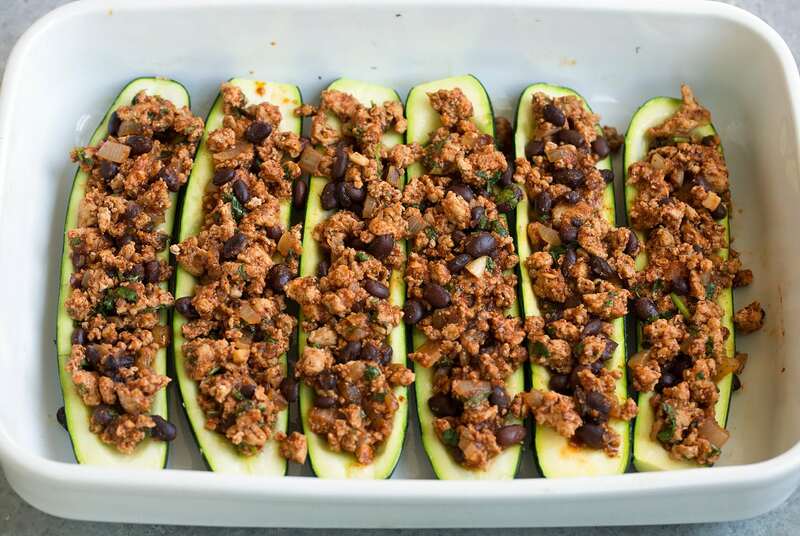 First you’ll preheat the oven and scoop out that zucchini center portion to make room for the filling. Then place them in two baking dishes and brush lightly with olive oil and season lightly with salt. Then you’ll roast those in the oven until almost tender. Meanwhile prepare the taco filling by sauteing onion in olive oil. Then add in ground turkey and garlic and saute to cook through. Stir in seasonings and saute briefly then stir in chicken broth, tomato sauce and black beans and simmer 5 minutes then stir in 2/3 of the cilantro and the lime. 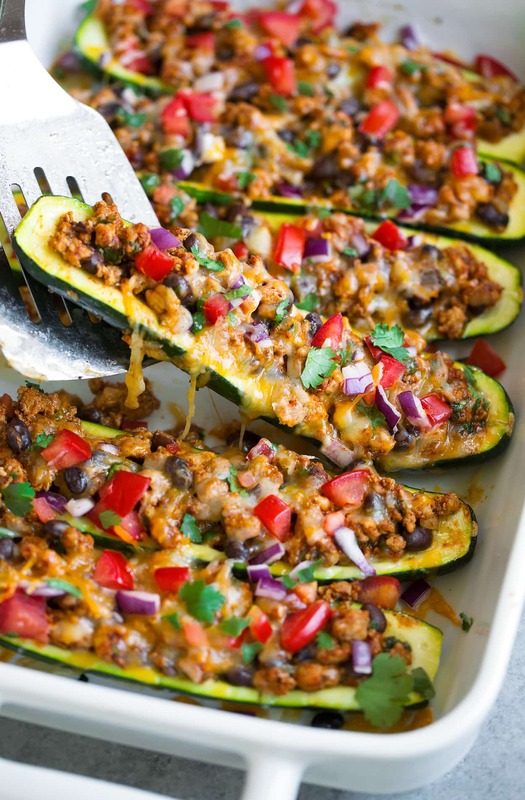 Spoon that taco filling into the roasted zucchini and sprinkle with cheese. Then return to oven and cook to melt cheese and finish cooking zucchini through until tender. Finish with tomatoes and cilantro and your other favorite toppings (like sour cream and Mexican hot sauce). Serve them warm. 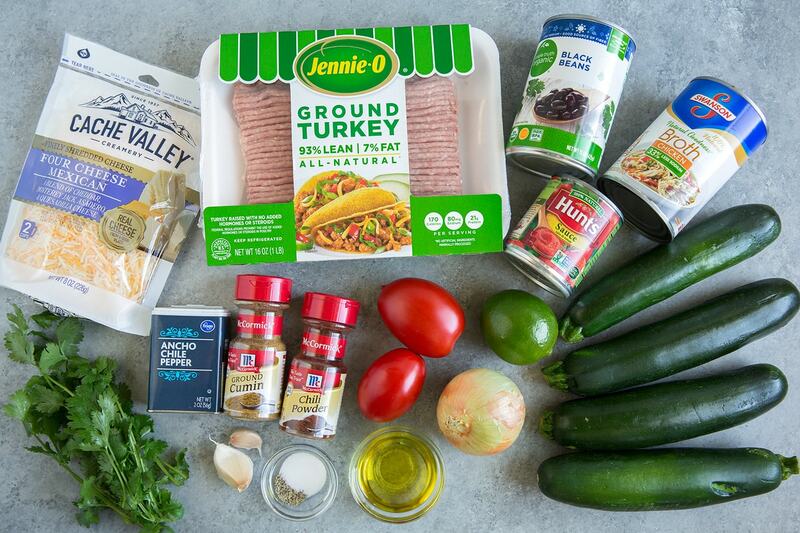 You should be able to fill about 5 zucchini (I’ve made these three times now and have had enough for 4 1/2 – 5 zucchini) or go with 3 or 4 zucchini and have a little extra filling for a taco salad for lunch the next day. How many zucchini you’ll need will just depend on the size of your zucchini. I should be about 2 1/2 lbs. 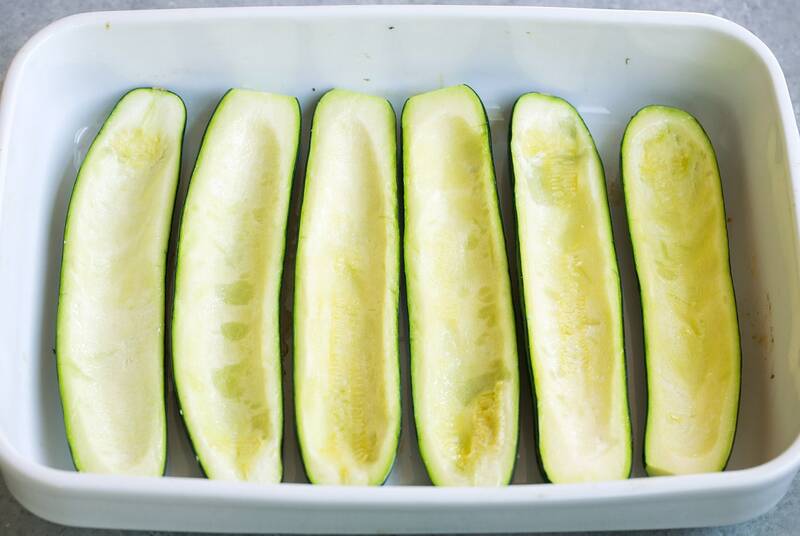 The baking time can vary a little depending on the size of the zucchini, if they’re fresh or not as fresh, how much filling was scooped out, and how tender you like the zucchini so just keep an eye on them near the end of roasting. You may need to add a little more time. These make good leftovers so even if you don’t have many people to serve consider making a full batch for meal prep. 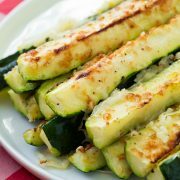 These are the perfect use for the abundance of summer zucchini. They're jam packed with flavor, they're perfectly filling, and have less carbs than the traditional flour or corn tortilla tacos. Talk about great way to get your veggie quota in for the day! Using a spoon, scoop centers from zucchini while leaving a little over 1/4-inch rim to create boats. 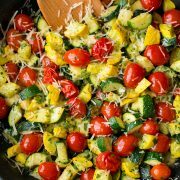 Place zucchini in two baking dishes (I used one large and one medium), brush lightly with 1 Tbsp of the olive oil and season lightly with salt. Roast in preheated oven until nearly tender, about 18 - 22 minutes. Meanwhile, heat olive oil in a 12-inch non-stick skillet over medium-high heat, add onion and saute 2 minutes. Add ground turkey and garlic season with salt and pepper and cook, tossing and breaking up occasionally until just cooked through. Add in chili powder and cumin and cook and toss 20 seconds. Stir in chicken broth, tomato sauce and black beans and bring to a simmer then reduce heat to medium-low and let simmer until sauce has reduced, about 5 minutes. Spoon in 2 Tbsp cilantro and the lime juice. 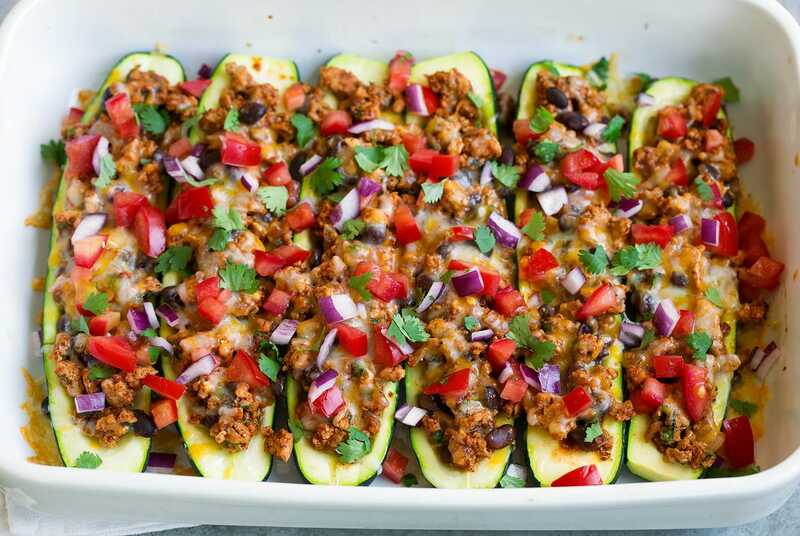 Spoon turkey taco filling into roasted zucchini, sprinkle top with cheese then return to oven and and bake until cheese is melted and zucchini are tender, about 5 minutes longer. Sprinkle with tomatoes and remaining 1 Tbsp cilantro then serve immediately.